Sonali Khatti is a mixed media artist who was born and raised in the Northeast, and now maintains a studio in Dallas, TX. She earned her B.F.A. from the Rhode Island School of Design and also holds a Postgraduate Diploma in Asian Art from the University of London. As a first generation Indian-American, Sonali’s work is inspired by her own cultural history and extensive travels to India. She has explored in depth the remote handicraft villages of Kutch, photographed the architectural palaces and rural landscapes of Rajasthan via train, and journeyed to many of India’s vibrant urban centers, including the holy city of Varanasi, along the Ganges River. In addition, she has studied at the Bhandani Workshop where she learned traditional Gujarati tie-dye techniques, as well as completed an apprenticeship under the tutelage of master dyer Toofan Rafai, who taught her the ancient arts of painting and block printing with natural vegetable dyes. "History and the registration of time, both on a personal as well as a universal level are my inspiration. 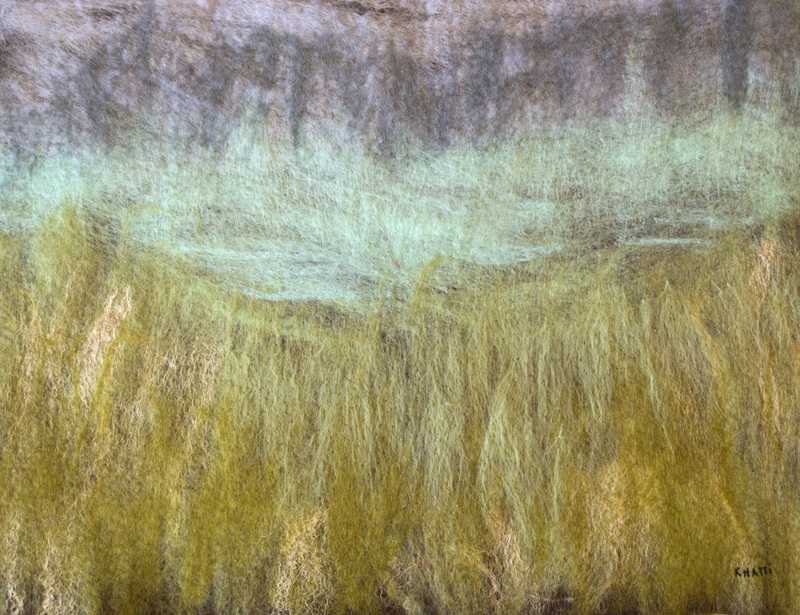 My paintings are created using the technique of wet felting, where wool fibers act as both my paint and my canvas. 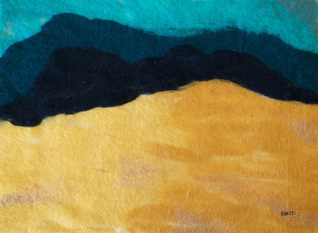 Each painting begins by laying tufts of dyed wool in directional layers. 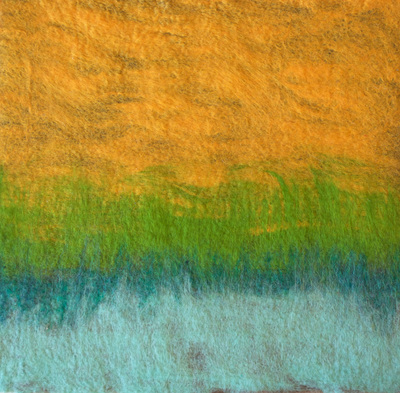 Recycled felt remnants, hand spun yarn, raw fleece, and a variety of other inclusions are also layered to form my abstract compositions. Afterwards, soap and hot water are applied, as well as pressure and agitation. Finally, the wool fibers begin to shrink and compress together, evolving into a piece of felt. My practice is intuitive, the process of felting is ancient; and I rely on my humble materials to connect me to my work on the most visceral level. Felting is unpredictable, and I never know exactly how the fibers will react with one another, and how this will affect my finished piece. My landscapes combine the blending of color and tactile forms that are caught in flux, sometimes buried and often times unearthed. Collectively, the viewer is transported to a unique sense of place and atmosphere. The purpose of each felt painting is to experience a passage of time by delving into the relationships between what has happened in the past, with what is left remaining on the surface. Through an exploration of migrating color, stitched marks and preserved forms; a story unfolds."